Today is Julia Child’s 100th birthday and it felt right to share something with butter in the title. Her cooking styles and words permeate so much of this blog and my cooking styles. Use fresh ingredients, eat real food, and truly enjoy what you are doing. I mean, that’s what life is all about, right? Happy Birthday, Julia. May you continue to inspire many more generations in years to come. To make pancakes, scrap out vanilla bean into a small sauce pan and add 1/2 cup milk with vanilla bean pod. Heat to a scald and set aside to let cool slightly. In a medium bowl, combine whole wheat pastry flour, baking powder, and salt. In a separate bowl,whisk together with the maple syrup, eggs, and oil. Remove vanilla bean from milk and pour with egg mixture over dry ingredients. Stir just until combined-don’t over mix. If batter thickens too much (and isn’t easily pourable) and a bit more milk. To make pears, melt butter in a medium skillet. Core pears, slice into thin slices (around 1/16″), and add to butter. 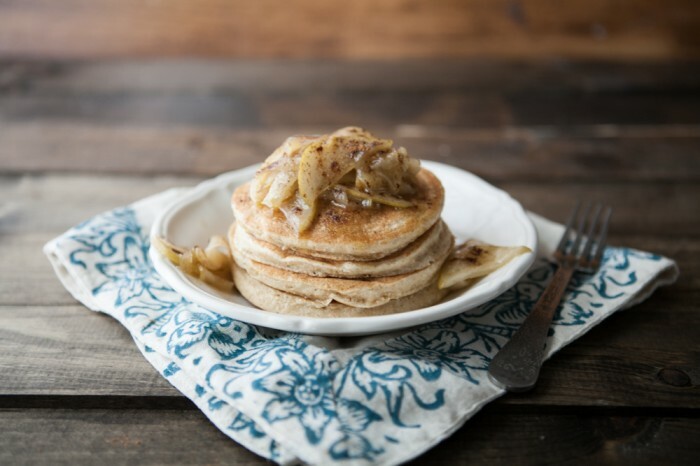 Stir in 2 tablespoons of maple syrup and continue to cook over medium-low heat until pears are soft. Add more maple syrup if you like a little extra sweetness. 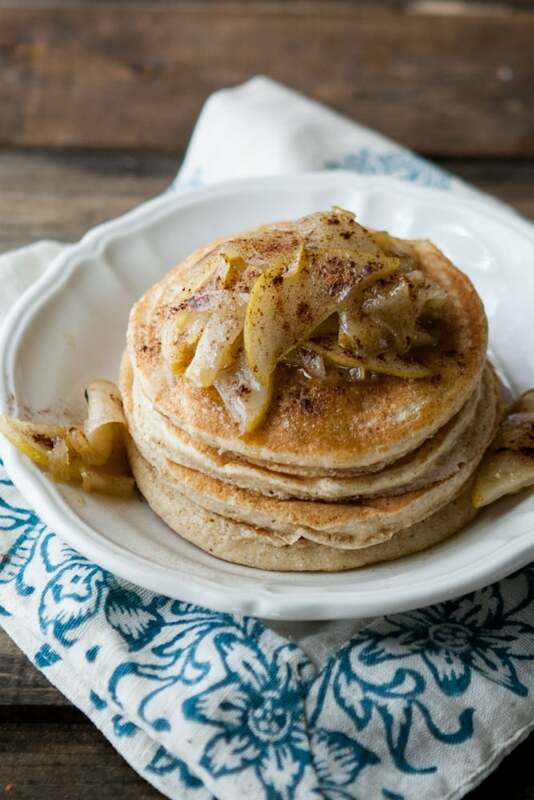 Serve pancakes with a healthy scoop of pears, liquid, and a sprinkle of cinnamon. Pears are my most favorite fruit. 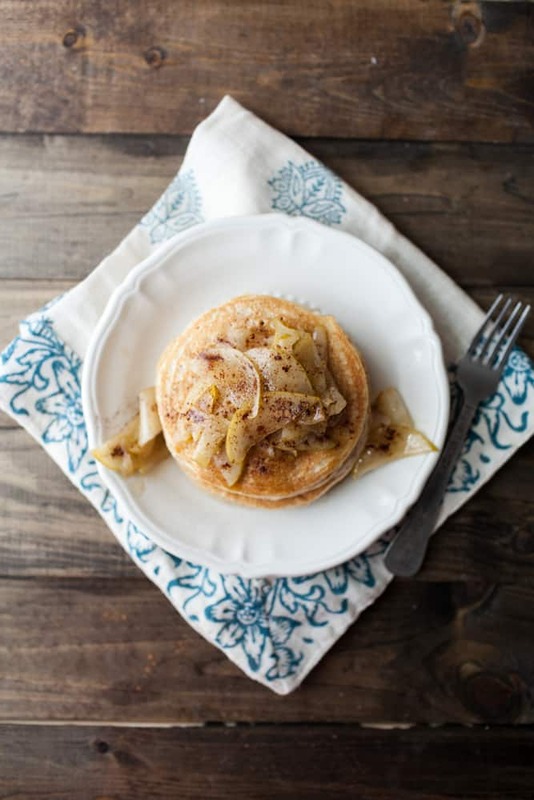 I *love* them on pancakes – this looks delicious! A lovely tribute and a delicious combination of flavours. What a lovely tribute. Happy Birthday to Julia! Yes, please! These sound awesome! the texture looks divine. Love the quote on top. holy moly, this is heaven in pancake form! Man do I want those pancakes in my belly right now. Gimme! I’m sorry to hear that about the pancakes- the batter might have been too thick or too overworked. I’m glad to hear the pears were good though!